With the use of the latest innovations in skin science and years of clinical research and experience, Dr. Garo Kassabian of Lift MD Aesthetics® has developed a skin care program that brings the expertise of the cosmetic surgeon directly to you. There are just three easy steps to better skin: Prepare, Perfect, and Protect. It’s beauty, simplified. Dr. Kassabian realizes the importance of having a simple, effective line of skin care products and systems that can be used as part of your daily routine as well as before and after surgery to achieve the healthy, youthful, radiant-looking skin you desire. 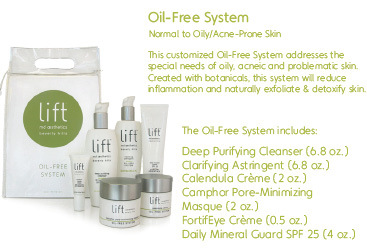 Lift MD Aesthetics® Skin Care Products are a unique blend of European botanicals and herbal extracts and they are brought to you by an expert in the fields of both medicine and beauty. The Oil-Free System is a skin care program designed for the person with normal to oily or acne-prone skin. This customized skin care system addresses the special needs of oily, acneic, and problematic skin. Created with botanicals, it will both reduce inflammation and naturally exfoliate and detoxify skin. The Oil-Free System includes a Deep Purifying Cleanser, Clarifying Astringent, Calendula Crème, Camphor Pore-Minimizing Masque, FortifEye Crème, and Daily Mineral Guard SPF 25. 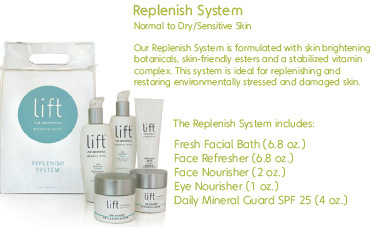 The Replenish System is a skin care program designed for the person with normal to dry or sensitive skin. The Replenish System is formulated with skin-brightening botanicals, skin-friendly esters, and a stabilized vitamin complex. This is the ideal skin care system for replenishing and restoring environmentally stressed and damaged skin. The Replenish System includes a Fresh Facial Bath, Face Refresher, Face Nourisher, Eye Nourisher, and Daily Mineral Guard SPF 25. These are just two of the expertly developed, innovative skin care products available from Lift MD Aesthetics ®. 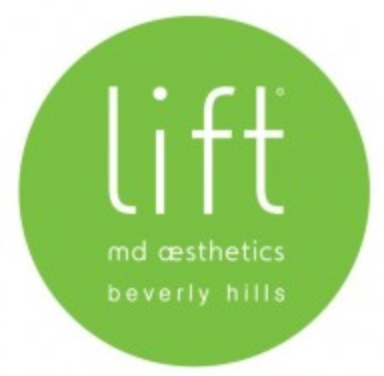 Check out our entire line of skin care products and systems at www.liftmd.com or call Dr. Garo Kassabian of Lift MD Aesthetics® at 310-285-0400 for a consultation to determine which of these skin care systems is best for you.